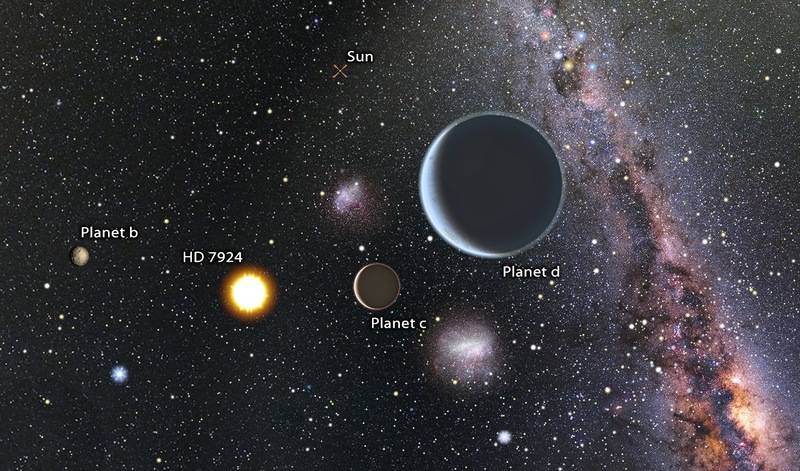 Astronomers have found three new "Super Earths" orbiting a nearby star. The star, HD 7924, is located 54 light years away which is really close by. These extrasolar planets -also known as exoplanets - orbit their star closer than our own planet Mercury orbits the Sun. They orbit their star in just 5, 15 and 24 days! By comparison Mercury orbits the Sun every 88 days. Thousands of extrasolar planet candidates have been discovered and it is estimated that there may be at least a 100 billion extrasolar planets in our Milky Way Galaxy. To date there has been no exoplanet discovery made of a planet like Earth in terms of size and mass. When we do find one will it be located in the "habitable zone" where liquid water can exist? Our precious planet's characteristics that support life are not necessarily unique in our Galaxy. But so far it seems to be somewhat uncommon in the zoo of planets beyond our solar system.